An enumeration type is a data type that consists of a number of elements (i.e. a list). A variable of this enumeration type can be set to any of the elements of that enumeration type (i.e. to any of the items on the list). This allows the user to create a variable whose value can only be set to an item from a list. This restricts the user inputs to a number of valid settings (hence reducing errors) and makes the code easier to read. Enumeration types can be created by using File->New-> Type (enumeration). The enumeration type created in Figure 1 does not contain any elements (i.e. it is an empty list). 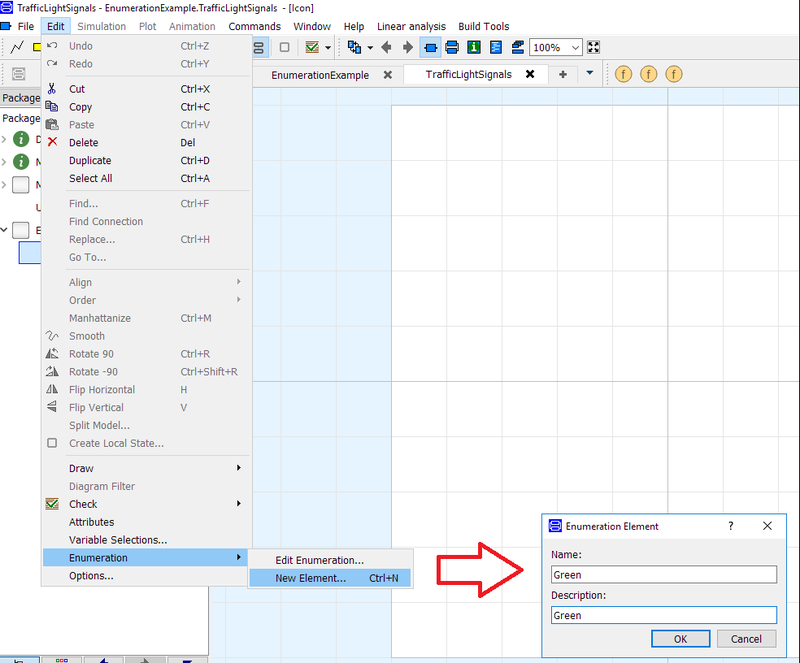 To add elements select the enumeration class and press Ctrl+N or Edit->Enumeration->New Element. Figure 3. Enumeration type code that was generated using the GUI interface as shown in Figure 1 and Figure 2. If an error is made while adding elements to the enumeration list, you can edit the list by going to Edit->Enumeration->Edit Enumeration or by going to the text layer and manually editing the code in the text layer (as shown in Figure 3). The example in Figure 4 makes use of a variable called trafficLightSignal of enumeration type EnumerationExample.TrafficLightSignals. 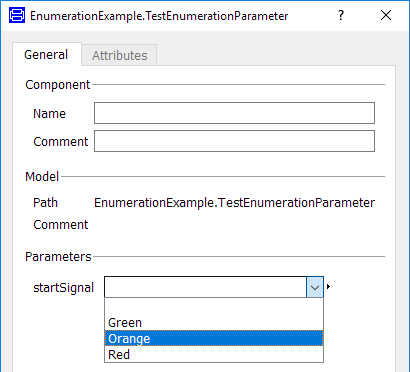 A variable that is an enumeration type can be set to elements of the enumeration list as in the TrafficLights model as in Figure 4. The result of the enumeration variable in Figure 4 is plotted in Figure 5. Figure 5. 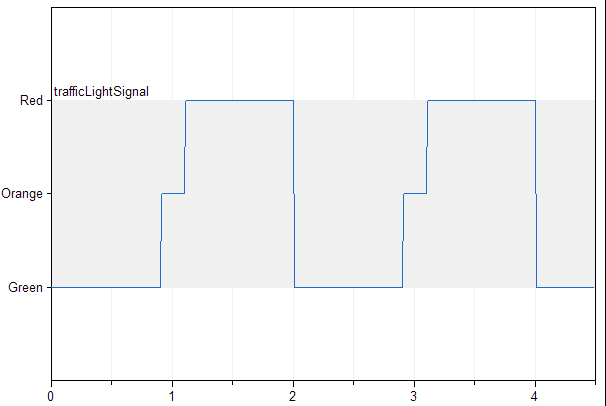 Plot of trafficLightSignal enumeration type variable. Vertical axis contains element’s descriptions. An enumeration signal (for example trafficLightSignal in the TrafficLights model) stores the information as an Integer with 1 being the first element in the list (i.e. Green) 2 being the second and etc. So the plot in figure 5 could be seen as Green being 1, Orange being 2 and Red being 3. To get which integer value is associated with which enumeration element use integer() for example: integer(EnumerationEample.TrafficLightSignals.Orange) returns 2.